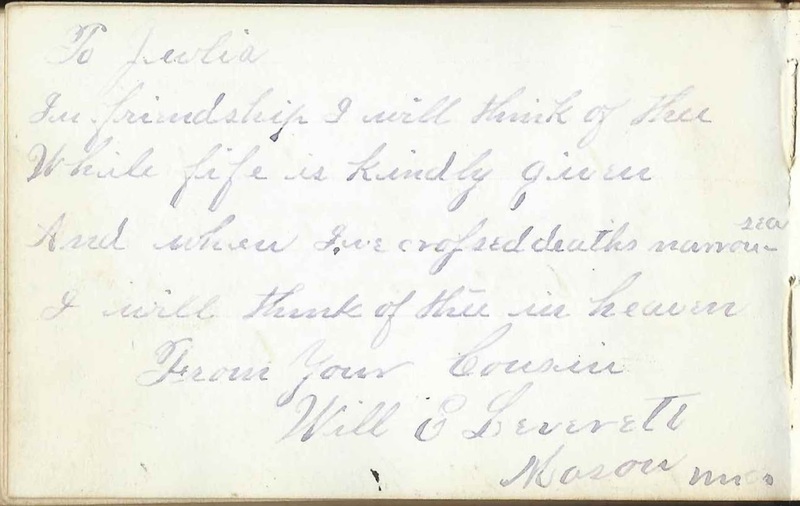 Heirlooms Reunited: 1870s-1880s Autograph Album of Julia Arance of Perry City, New York; possibly Student at Cook Academy at Havana, New York. 1870s-1880s Autograph Album of Julia Arance of Perry City, New York; possibly Student at Cook Academy at Havana, New York. 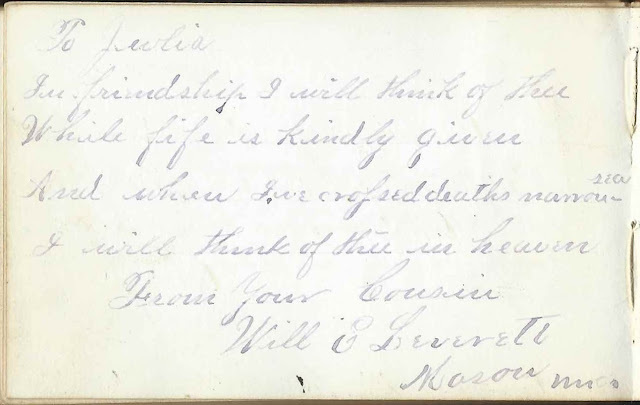 1870s-1880s Autograph album that was given by Henry Arance to his younger sister Julia B. Arance of Perry City, New York. Judging from a couple of the inscriptions, Julia may have attended Cook Academy at Havana, New York. Cook Academy was founded by Charles Cook, who was instrumental in the founding of Schuyler County, New York. The inside front cover and the first page of text, though there may be missing pages. The album measures approximately 4-1/4" by 2-3/4" and contains the sentiments of 100 of Julia's relatives, friends, schoolmates and teachers. An alphabetical surname list and an alphabetical list of the inscribers, together with any personal information they offered, appear at the end of this post. Julia B. Arance was born in 1865 at Perry City, New York, the daughter of George Arance and Joanna (Brown) Arance. In addition to older brother Henry, Julia had several other siblings. According to the 1900 Census of Hector, New York, Julia had married husband Lawrence McCarthy about 1883. By 1900 they had four children. Julia died in 1911 and Lawrence in 1928. They're buried in the Mecklenburg Cemetery at Hector, New York. According to his Find-a-Grave memorial, Henry Arance was born in 1857 and died in 1927. He married Alice Updyke about 1890. Arance  L Lane Sirrine ? Ed. B. C. or Ed. B. A. Written upside down on the last end paper: "Presented to Julia by Henry your Brother. Miss Julia Arance of Perry City, New York. Henry Arance." Anna Bower of Waterburg, New York; inscribed on August 11, 1878. Lissa E. Bower inscribed the left facing page. Lissa E. Bower; her surname runs off the page after the third letter, but since the facing page is inscribed by Anna Bower [of Waterburg, New York], I believe Lissa's surname is also Bower. D. E. Cook of Hornby, New York, in Steuben County; inscribed on April 14, 1882. "Compliments of the North Wind"
Reward of merit pasted on page: name looks like Allie E. Douby, but could be Allie E. Davey, who inscribed another page. E. E. Davie of Trumansburg, New York. "F. L. O." Ida E. Gifford of Aurora, New York; inscribed on November 21, 1881. "D.A.F." A. R. Poppino of Perry City, New York; inscribed on September 22, 1879. Julia's cousin. John B. Porter of Ithaca, New York; inscribed on February 15, 1881. "Julia Arance A.M."
D. Revelson of Canandaigua, New York; inscribed on July 8, 1882. "Brakeman N.C.R." Almira Thompson of New Bedford; inscribed on August 7, 1878; she inscribed another page as well.